The international scheme by which ships plying the various oceans and seas of the world are recruited for taking and transmitting meteorological and oceanographic observations is called the Ship of Opportunity Program (SOOP) scheme. The forerunner of the scheme dates back as far as 1853. From the very beginning, ships’ meteorological observations were recognized as being essential for the provision of safety related meteorological services for ships at sea, as well as for climatological purposes. 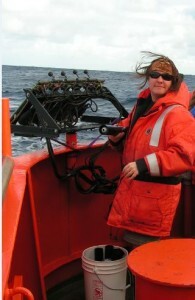 The Ship of Opportunity Program (SOOP) recruits ships to programs above and beyond meteorological observations, such as sub surface temperature profiles, salinity sampling, drifter and float deployments, atmospheric gas sampling, oceanic CO2 sampling, automated high-resolution meteorological sensors, and continuous plankton recorders. There is a great deal of interagency cooperation in the running of these programs. The SOOP fleet collects data and samples, or deploys equipment, along their normally scheduled runs. Sometimes scientific technicians ride on the ships in order to operate the equipment. Many scientific agencies have realiz ed that cooperative efforts with commercial ships are extremely valuable. Typically, a commercial cargo ship that travels a route of interest is approached to see if they would be willing to carry and operate or deploy oceanographic equipment such as temperature probes, drift buoys, air sampler or other apparatus. If the Captain, officers, engineers and the shipping company agree, then the equipment is loaded, installed and then operated by the ships crew, usually the navigation officers. Why would the ship agree to volunteer for this program? Very often the Captain and officers are actually interested in these scientific endeavors. The amount of time we request from them is minimal. They can see that the information benefits the oceanographic and meteorological community in the abstract, and can be of benefit to the commercial fleet as a whole by the development of better climate models and weather forecasting. I have found the officers of these ships to be highly educated and positively enthusiastic about these programs. After the recruitment of a ship, and the installation and training, the ship is met every time it arrives at the Port of Los Angeles or Long Beach. The ship meet can involve loading more expendable bathythermographs (or XBT’s – temperature probes), air sampling flasks, oceanographic drifting buoys for deployment at the equator, equipment maintenance and data download. I always organize the use of the ships crane with the crew and the stevedores, check in with the Captain and officers, perform routine maintenance and train any new officers if necessary. I have been working with some of these ships since 1998, and have made some very good friends.